In the last 5 years, since when I started my first website, I’ve seen many friends quitting their blogs. The main reason is always the same : they do not receive enough monetary compensation in order to live just with blogging. The classic case is when someone is dazzled by the false glitter of the internet with the great opportunities of gaining large sums of money just sitting in front of their computer without making any effort. So they start a blog, perhaps leaving their jobs, and investing time in creating content and an appealing design for their site, even spending money in buying guides which promise to unravel the secret of making money online. The truth is that there is no secret. You just need to have passion, dedication and hard work : you will discover that making money online is a real opportunity. Of course you need to find the right articles that gives you the correct information about resources to use in order to monetize your site. And in this post I am going to introduce you teliad. teliad is a service provider that helps advertisers and publishers connect each other in order to make great deals for both parts. Bloggers can monetize their sites with several kinds of products and advertisers may use the platform to improve their visibility on the internet. The company was created back in 2005 in Stuttgart, Germany, when they were only offering Text Links. They soon expanded into other countries, including France, Spain, Italy and the UK / US and added many new products and features during the time. At the moment, Teliad is available in 5 different languages : English, German, French, Italian and Spanish (teliad.com, .de, .fr, .it and .es) : they are very international! It is right now the largest platform in Europe and has offers from 30+ languages. They count more than 8000+ independent bloggers and 30000 webmasters who are using their products to monetize their sites. Bloggers are always browsing the web for new opportunities to make money online. With teliad you can become a publisher and earn with your blogs, by using different products. You just need to register here, and submit your offer. Every site you want to monetize with teliad gets manually reviewed before being accepted (this tells you a lot about the quality of the platform). 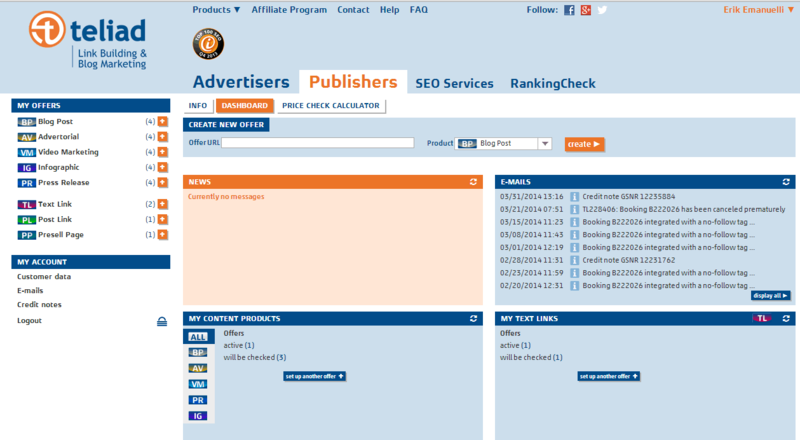 teliad wants to offer to their advertisers just the best of the web. In order to get approved, be sure to keep your blog updated on a regular basis. If you have good search engines rankings and important social media influence, you are more likely to be accepted. The content quality also has a very high priority. You can make money on a monthly basis or one-off, depending on the offers you create. Also, you may want to use their tools to determine the RankingCheck or RankingScore of your site. In addition, their Price Check Calculator will estimate in advance how much you will be able to earn depending on your blog ranking. Once you submit your offer, there is a price range you can choose from. The price range is set depending on different factors such as domain popularity, number of external links or social media reach. Visibility on search engines is also important, so be sure to check your rankings using the mentioned tools (RankingCheck or RankingScore). Over the years, they have increased the number of ways that bloggers can use to monetize their sites. There are 8 different methods, which can be divided into two different categories: classic and new products. – Presell Pages : new pages you can add in your blog with unique content provided by the publisher. – Press Releases : these are news published by the companies, which include usually one image file (as for instance, the company logo). The content is provided by the advertiser. Are You Google Safe for Using teliad? I am sure this is an important question for you, as a blogger who wants to monetize your site, but doesn’t want to be penalized by Google. You do not need to consider teliad as a link network. They have an anonymous portfolio. No publisher URL is shown until the advertiser bid seriously. As mentioned before, each published site is manually reviewed before being accepted. So they accept just high quality blogs. There is a “NoFollow” or “DoFollow” links choice. And I think this is great, so you can sleep soundly. You can also reject any bookings, if you think it can’t match properly on your site. You have plenty of control on that. There is a natural integration, with normal HTML code, which means there is no need to add extra unnecessary code. So you understand teliad is not used just for SEO, but for real content marketing. This is not only a platform for buying and selling links, but Teliad offers real value through content with their publishers : the bloggers! I have been using teliad for a couple of years and I am pretty satisfied with the results. I am sure you can give this platform a try in order to add another monetization form to your blog. What I like more of teliad is that they have the “German” attitude (that I love), which means they are really professional and honest. You will be paid each month without any delay, and if your site increases its rankings, the price of your offers will be adjusted automatically. I have received past emails from teliad which communicated an increase of the monetary compensation for my offers, specifying the new and the old price and rankings. This is great, also because your site progress is constantly monitored and you will be updated accordingly. I suggest you to register at Teliad and add a great new form of monetization to your blog! So what do you think of teliad? Please share your experience leaving a comment in the section below, thanks! Totally new to teliad but it looks solid. Monetizing through different channels appeals to me. glad to see you here! As you know, adding a new form of monetization to your site is a great way to diversify your online income sources. teliad seems really great platform for monetization and I guess I need o give a try to it once. Glad to see you found something new, Samir. teliad could be a great form of monetization for bloggers. I registered on teliad on last year but I totally forget about this, need to look at it again. They added new content products now, Vivek. You should take a look and post some offers on their marketplace. The dashboard of teliad seems really impressive and I’d surely check it out. Glad to hear that, Vicky. Teliad is new to me but it seems promising. I’ll give it a try. It’s a great way to monetize your blog! I signed up to teliad some weeks ago but have been reluctant to activate my account. You know what happened to postjoint and the rest has been a deterrent. I see your point of view, Enstine. Just the choice of having the “nofollow” tag in the product offers should be enough to give teliad a try. Glad to see this article inspired you again. Thanks for commenting, my friend. A good review about Teliad network. You have explained in detail.I thought it was just for making sponsored reviews till reading your post.BUt now I undertood that there are variety of oppurtunities to earn from it. But Erik can you tell me what factors they consider for approving a blog? what traffic volume should we have? teliad does not specify the exact information on which basis blogs are accepted. Hey Eric, I was contacted by Teliad and I got so excited to see the opportunities to make money from my blog. After setting up my blog (this blog) their automated system set some good rates. But after many months I haven’t see an offers from Teliad, am I missing something? Good to learn that you are making money off 1this service. It may take a while before some advertisers will bid on one of your offers. But “many months” seems too long. You can take a look at your teliad dashboard and create some new offers with the latest content products. Thanks a lot for the input Erik, I haven’t put much effort over there after I listed my site. Will have a look at it. I am always on the look for new ways to monetize my blog to support the future development of my blog, and teliad seems to be the right choice. Although there website design seems to be very basic but With all of the ways mentioned to monetize a blog and with your recommendation I will definitely check them out. Sometimes basic and clean design is the better choice. And let me know if you need any help. This is a very informative and meaningful post for blogging. to make money and it is the best way for blogging and blogger to earn plenty of money i will try to follow this one. I’m hearing about teliad for the first time. Will check it out! No doubt its a best method for monetization and I haven’t tried it though. I’d like to know you personal opinion regarding the payouts of telaid. as already mentioned in the article, teliad do not miss payments. They are really precise and honest. Signed up for Teliad buh dont really see how this platform can help or is it Just My eyes or how i sèe it? glad to know you registered. Have you submitted your sites? And I guess they have been accepted, right? So you just need to insert some offers in the marketplace. Like “blog post”, “advertorial”, “text or post link”, “presell page”, etc. Then you should be done. Just wait for new bookings, Babshaybell! I have heard of lot of new networks like Adbeans which sounded pretty new for me and Teliad goes in the same category. I am an Adsense guy and am completely addicted to it but it is time for me to try different networks. I will certainly give it a try and will come up with my opinion about it. Thanks for the share Bro!!! Adbeans seems not active anymore, at least for me. Teliad recently rebranded to “SeedingUp”. Its a great alternative of google adsense. Thanks buddy. Really helpful. glad you found the post useful. Teliad is now SeedingUp, have you signed up?